Altitude: 900 to 2700 masl. Latitude: between 28 and 29,5° degrees South. Climate: continental, dry and semiarid. Heliothermal index: 3380 in Tinogasta and 3042 in Chilecito. Cool night index:15,5°C in Tinogasta and 14.4°C in Chilecito. Drought index:-205 in Tinogasta and -128 in Chilecito. Highest temperature in summer: 33,3 °C in Tinogasta and 33,4 °C in Chilecito. Thermal amplitude: 15 °C in Tinogasta during January and 15,1 °C in Chilecito during January. Summer rainfall: 162 mm in Tinogasta and 135 mm in Chilecito. Predominant soils: soils are mostly alluvial and possess a loamy, sandy-loam structure in the entire valley region. 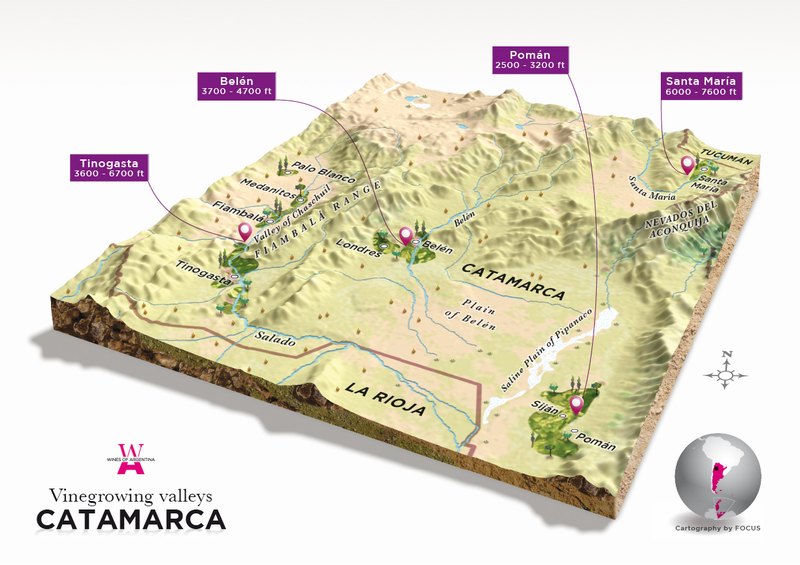 Prominent varietals:in the Catamarca Valleys red varieties such as Syrah, Bonarda and Malbec. In La Rioja, Torrontés Riojano, Cabernet Sauvignon, Bonarda and Syrah. Main characteristics of the wines:white wines from this region tend to have greenish color and intense fruity aromas. They are medium body wines and have moderate acidity. Red wines, especially those from Famatina Valley have mild color intensity, violet tones and aromas that highlight the fruit’s maturity. It is ideal to drink them throughout the year as young varietals. In the Tinogasta-Fiambalá region there are over 9 thousand ha planted with vineyards; they represent 4% of the country’s surface. Out of that total, more than 2300 ha belong solely to the plantation of Torrontés, a variety that was born there. This area holds a string of valleys located at the mountain foothill, within the provinces of Catamarca and La Rioja. The most important subregions are Tinogasta in Catamarca and Chilecito in La Rioja. In recent years, the process of transformation that the Argentine wine industry has undergone, reached the Northern region. Thus, a considerable amount of the surface that had been historically linked to the production of wine in large quantities and with a lesser oenological quality was replaced by varietals that have greater demand and produce outstanding wines. Generally speaking, the region holds many white varieties in comparison to other places in the country, given the influence created by the birth of Torrontés. However, red varieties such as Syrah and Malbec have begun to develop excellently. This region’s white wines usually have colors with greenish tones and very intense fruity aromas. They possess good structure and balanced acidity. These wines are perfect to be consumed within a year. Red wines, especially those from Famatina Valley, possess color of medium intensity, with violet tones and aromas that reveal the fruit’s maturity. In some areas of La Rioja, like the Paimán slopes, located over 1700 masl, amidst semiarid and dry weather, intense and deeply colored, full-bodied wines are created. Malbec accomplishes great complexity and characteristic aromas. Within the region, you can find both traditional wineries as well as new wineries. The latter have incorporated new technology such as cold-chain and stainless steel recipients. This area holds a competitive advantage as producer of high altitude wines. In addition, wine growers are working on the creation of organic wines: an added value in relation to other products in the market. “La Rioja’s wine industry is almost as ancient as the country itself”, stated Dereck Foster in his 1989 publication, “The Book of Wine”. In 1661, in the time of the colony, grapevines were starting to prosper in La Rioja, under the caressing sun of Nonogasta Estate. These vineyards, planted by Captain Diego Garzón, were pioneers of the industry. Some years later, in 1633, the Fathers of the Society of Jesus, missionaries at the Famatina Valley, wished to obtain grapes to give as an offering to God. Thus, they bought land, increased the number of plantations and produced their own wine. They slowly began to export to the rich and booming Potosí. A major endeavor that symbolized an important growth for the industry took place in 1803; Mister Inocencio Gordillo bought the Nonogasta vineyards. This purchase gave a great drive to the area and to winemaking in general. His sons’ generation founded four wineries there, boosting this growth even more. The winemaking activity continues to grow today in the hands of settled families and artisanal wineries that produce regional white wine. Wines from La Rioja are beginning to gain presence throughout the entire country. This area, home to a dry and dusty river and located amidst the foothill of The Andes, is responsible for the production of fresh and aromatic white wines created with the Argentine white variety, Torrontés from La Rioja. The little town of Famatina and the larger city of Chilecito are home to approximately 500 vineyards across the region. They are family owned and produce grapes of the ‘La Riojana’ Cooperative that runs in the valley. ‘La Riojana’ Cooperative was founded in 1940 by Italian immigrants. Nowadays, it is the dominant force in wine production in Famatina Valley. This region develops in high altitudes. Vineyards at Famatina can be found between 1000 and 1500 masl. At this height, grapevines receive intense sunlight irradiation during the day and experience cool nights. This leads to a prolonged growth period in which grapes take the time to develop complexity in flavors and acidity. The North-South orientation along the edge of The Andes creates a wind tunnel whose benefit is the augmentation of ventilation. Dry winds together with scarce precipitations imply a low disease threat for the grapevine. Soils in Famatina are sandy and alluvial. The scarce rainfall and soils with good drainage assure producers great control over grapevines and, by limiting irrigation, they can produce vigorous and highly concentrated fruits. Even though Torrontés is by far the most relevant varietal cultivated in Famatina Valley, the ever-present Malbec continues to produce excellent wines in this region, along with other varieties such as Bonarda, Cabernet Sauvignon and Sauvignon Blanc.